From Roses to Rainbows: Happy May Day! Hi Hilary! 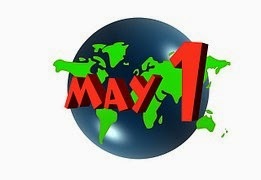 I don't know of any May Day celebrations here. It has been a cool day with rain and sunshine, sometimes both at the same time. This is interesting stuff I didn't know! I can see everyone heading out picking greenery and flowers to bring inside. I'd do that here except our allergies are so bad we close our windows up tight against the yellow clouds pollen. Happy AMaying! I bet it's a great time of year to go to the Green Dragon. That is such a cool place. Sorry you are suffering with the pollen. We still have pollen, but to me it doesn't seem as bad as some years...more rain maybe. No May Day celebrations here, but I like the idea of heading out into the forest and picking wild flowers. We have a few absolutely stunning days lately. The ones that make just want to sit outside. It's still cool enough to enjoy it, but it won't be for long.